At the end of a rainbow you will find a magical colourful unicorn. 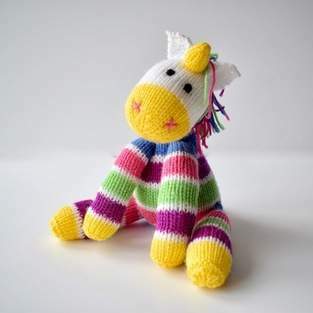 You only need to know 4 stitches to make this rainbow unicorn: knit, purl, kfb and k2tog. TECHNIQUES: All pieces are knitted flat (back and forth) on a pair of straight knitting needles. This pattern only uses basic stitches: knit, purl, a k2tog decrease (knit two stitches together) and a kfb increase (knit into the front and back of a stitch). You will also need to knit stripes (change colour at the end of a row) and do some seaming. FINISHED SIZE: One size: The unicorn is approximately 22cm tall (sitting).